Minimalism is the thing that gets us past the things that clutter our lives so we can make room for life's most important things - which actually aren't things at all. At age 30, best friends Joshua Fields Millburn and Ryan Nicodemus walked away from their six-figure corporate careers, jettisoned most of their material possessions, and started focusing on what's truly important. 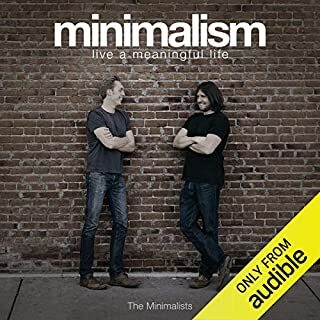 With little to no background research, these guys use their past history and personal advice to try and improve your life by living in a minimalist way for you. However most chapters came across as judgemental and many of their arguments were just plain stupid. Friends and family dont just fall into three categories and relationships can be very complex. Their recommendations on diet were just ridiculous. cutting out meat, sugar, dairy and gluten just because you tried it and it worked for you doesn't make it a minimal approach to eating well. The whole concept of nutrition and changes that can be maintained were glossed over. A minimal approach can be great however I did not feel that these guys were very good at explaining what that even means. A minimalist book made for plebs. I was not able to finish it, I snapped and turned it off after around chapter 6.